The end of summer doesn’t have to mean the end of using your outdoor space for relaxing with family and friends. With just a few swaps, tweaks, and additions, you can transform your patio from a summer paradise to a comfy and cozy fall retreat that you’ll be able to use even as temperatures begin to drop. Here are some ideas to help get you started. Give everything a thorough cleaning. Your furniture, sun umbrella, and patio itself have undergone heavy usage and been exposed to tough weather conditions for the past few months, so now it’s time for a little TLC. Some mild soap and warm water should suffice for the seat cushions and umbrella, while sturdier furniture and the patio can stand up to the hose. Inspect your furniture and make repairs or replacements where necessary. Does that patio chair have a wobbly leg? Is that seat cushion saggy or losing its shape? Is rust becoming a dominant color theme? If so, now is the time to repair the chair leg, replace the foam seat cushions, and repaint the furniture so it looks and feels as good as new. Put “summer only” items into storage. Pool accessories, sandbox toys, gardening tools, and anything else that won’t be used until next summer should be put into storage now. This will help declutter the patio and yard and give you more space to work with. Give the decor an autumnal overhaul. Switching from bright, summery hues and floral patterns to the darker, richer tones associated with fall is a great way to mark the changing season. 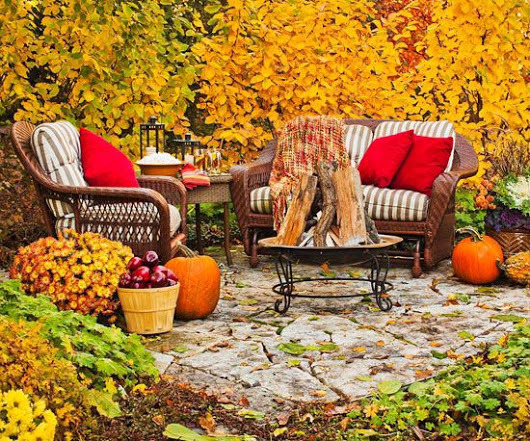 Think red and orange as well as deep yellow and forest green when selecting fabrics, and be sure to use plenty of fall foliage, pumpkins, Indian corn, and pine cones as decorative accents in your outdoor space. Add warming elements to keep your patio cozy. Be prepared for cooler fall nights by adding a few warming elements around your patio. An area rug can take the chill off a cement patio, while woolen blankets or fleece throws provide extra warmth while lounging on the couch. For the ultimate in backyard warming, consider using a fire pit, chiminea, or outdoor fireplace as well. Install plenty of outdoor lighting. Days are shorter in fall, which means outdoor lighting is even more of a necessity in this season than in summer. If you plan to use your backyard and patio well into evening hours, be sure to install plenty of outdoor lighting along walkways, around furniture, and in other strategic locations.